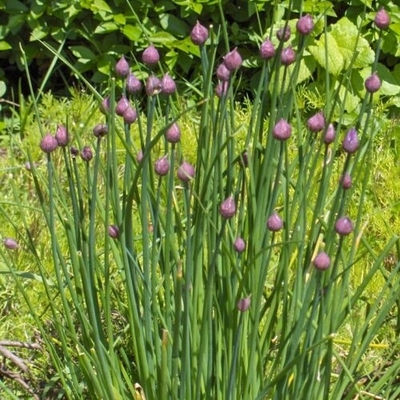 Onion chives are pretty to grow and delicious to eat. 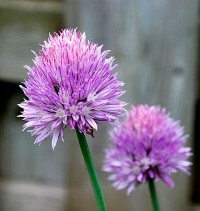 Their purple (or white) pom-pom flowers sit atop aromatic stems in summer. The leaves are are used in soups, salads and potato dishes. (A must for topping baked potatoes, right?) and they have a mild onion flavor. The flowers can be used as garnishes. These plants grow in dense clumps and need to be watered all season — keep the soil evenly moist. They need at least 6 hours of sun. Watch for the first sign of wilt. Feed with a vegetable fertilizer to ensure a bountiful harvest.